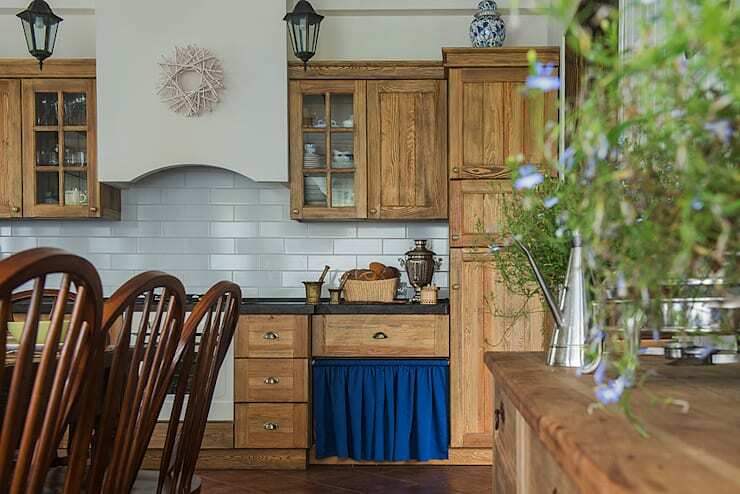 The kitchens and accompanying furniture we will see in this ideabook are ideal for romantics, for those who like wood and colour that characterise things from eras before. It is for those wo love tradition and natural taste. Here we will go on a journey of 10 country style kitchens furnished with that love for the simple and rustic, not to get lost in grey cement. The selection of furniture and decorations in this ideabook will suit large and medium spaces, as well as for those little kitchens where the rustic and rural styles so comfortable, they feel much larger. The variety of designs corresponds to the creative breadth of our days, which revives and redefines the spirit of design eras which have come and gone before. Thus, we now have this panoramic view several different country style kitchens, each with its own design and defining characteristics. 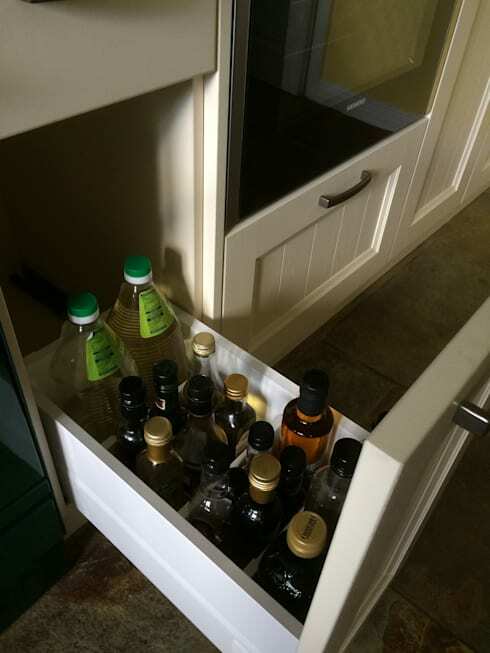 In each of these examples you are sure to find something applicable to your own kitchen. We hope you enjoy the tour of the warmth offered by these kitchens furnishings and decorated to make one sigh. These furnishings offer the absolute simplicity of a rural kitchen. Just a few shelves on the counter are used for dishes and ceramic tile, and for some kitchen items to keep the old balance. Natural oak is a typical wood furnishing in a rustic or country kitchen. This is especially true when it is natural, just polished and waxed, without glare or external draperies. We see in this image that nothing is missing to acclimate the kitchen as a rural space, including the stone countertop. The rustic and rural styles, which are both full of charm, share a country air. Here, the furniture answers to that warmth that transmits peace and tranquillity through a connection with nature. 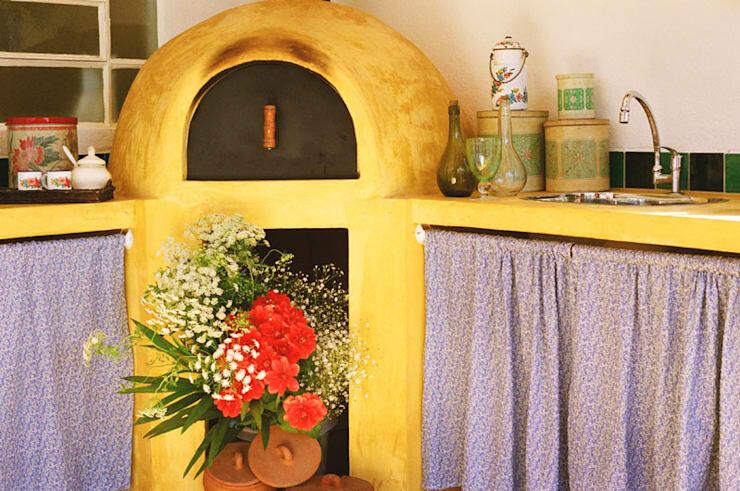 The clay oven we see in this image, represents a typical rural kitchen. The mud can, however, be simulated by cement or concrete polished and painted with some good traditional colour, like mustard, yellow or red. Cotton curtains are another feature of this style. This kitchen includes furniture ideal for large spaces and busy kitchens, where you can meet to cook with family or friends. It also works in spaces without divisions, where multiple shelves with ornaments can be seen from the sofa or dining room. Usually, both rustic and rural are associated with the old and traditional. That's why interior designers and decorators currently emulate some typical characteristics that give each object and space that original imprint. The oil colour we see here combined with bronze allows for an atmosphere which is so charming. Clay pots and vases of ceramic green are some of the decorative objects that go well with the rustic or rural furnishing in this kitchen. 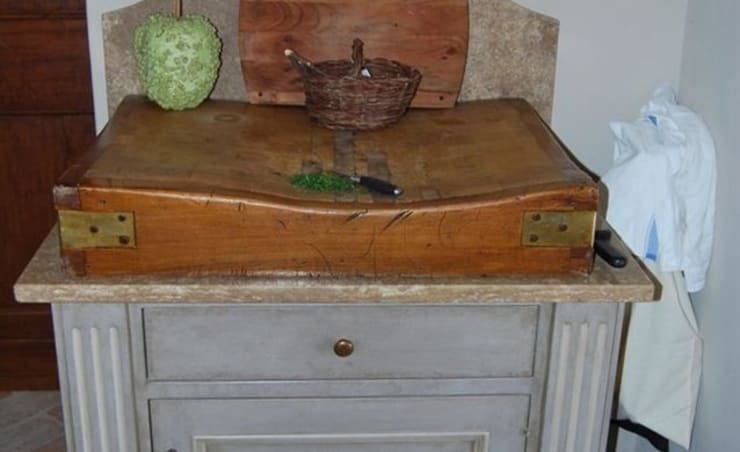 A rustic kitchen furniture should respond to a special taste for the home, in this case, home cooking, full of flavour! Good furniture with drawers and drawers to store everything is very typical of this style. It will be worth your while to get a kitchen planner involved in this to make the most out of your kitchen. 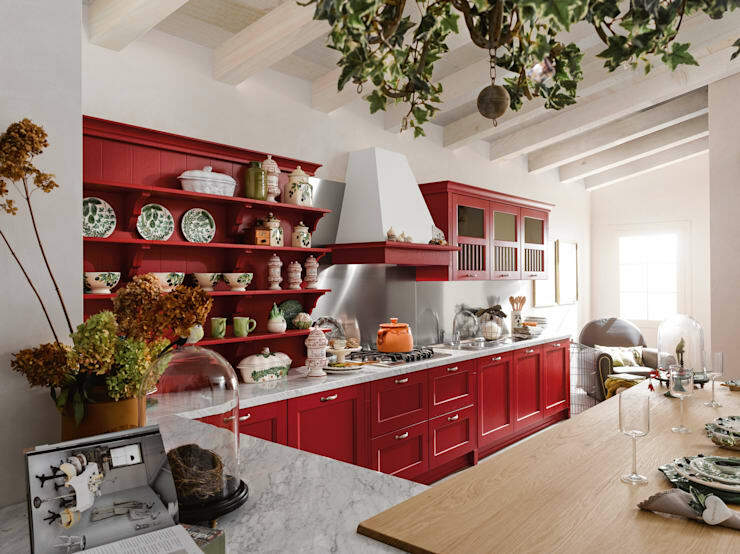 When it comes to rural kitchen furniture, marble occupies a privileged place, since it is a robust and strong element of durability. 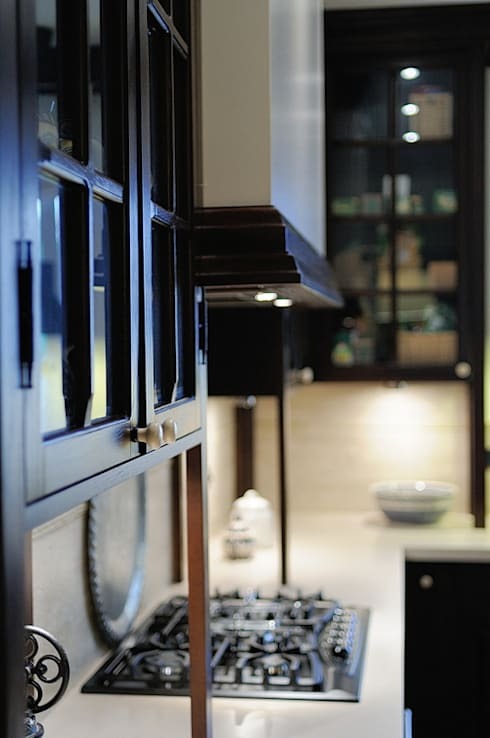 Moreover, wood is indispensable to decorate a kitchen in this style material. 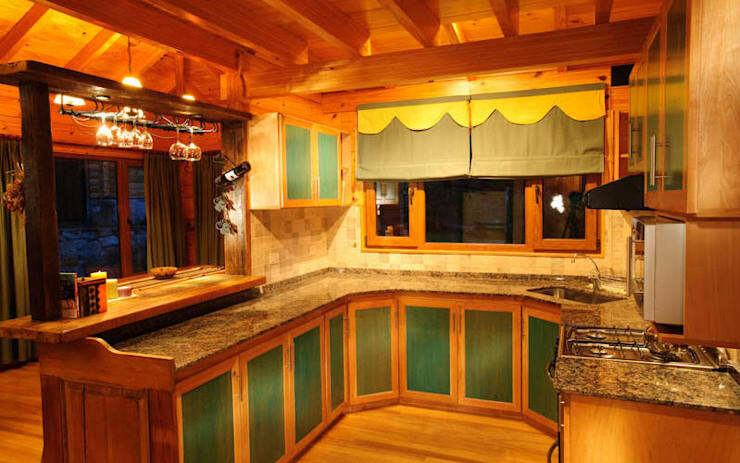 A rustic kitchen has a feel and taste for craftsmanship – a dedication to quality work. This allows for rustic furniture or a rural kitchen to be elegant and sophisticated. 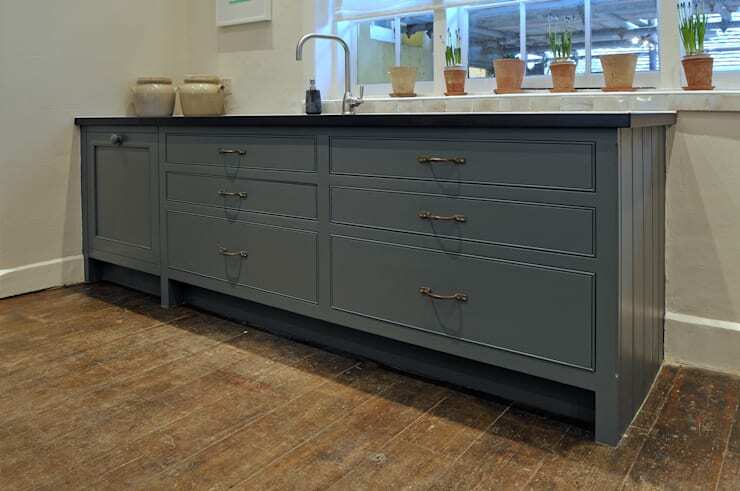 This is a beautiful bet for a rural or rustic kitchen – a space without doors. The effect is strong and makes decorating a real challenge. Each item in sight must respond to the beauty and harmony of the whole. What a lovely touch! 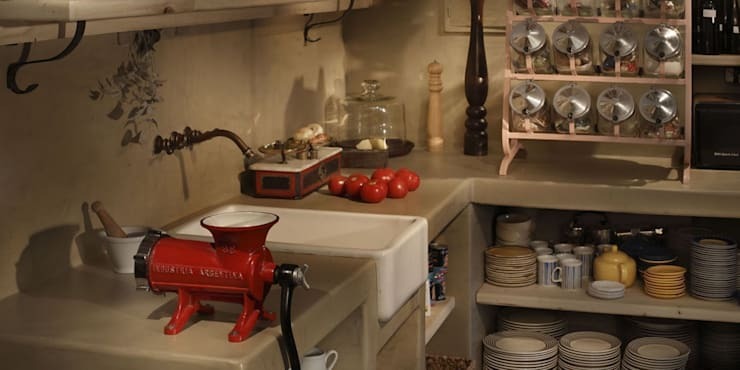 In this scene we have the minimum elements that a set of kitchen furniture in rustic or country style needs: matte wood tones with subtle features that simulate wear, marble, wood, and decorative objects denoting simplicity. For a little more inspiration on the topic, take a look at: The warm feeling of a rustic kitchen. Which one of these country kitchens did you like the most?